we get ansty like that too if our momma is late, although you are pretty distructive–hehehe! thank you for the support on our bloggy! guinness is doing much better now! will have a full report tomorrow. thanks again! Oh no, someone’s going to be in trouble Dennis. By the way, we saw a wonderful piece on Vizlas the other night on Dogs 101 and we thought of you. Oooooh Dennis we betted you did get in trouble fer that one. Mamas. They are SO hard to train. dennis! i’ll bet you’re getting in trouble for that one! It looks like it doesn’t pay for your mom to work late, Dennis! I do think that is some beautiful artwork Dennis!! I am sure your Mama LOVED it!!! Your antics leave me speechless, Dennis, speechless and shocked! You said when mama works late. So where was dada? Was he involved at all with that big party? I honestly don’t see you doing anything other than waiting patiently for mama to come home. Although I do find the texture of your carpet puzzling. Looks like somebody forgot to vacuum maybe. Oh my god! But, you must have had great fun! Oh dear, did some vandals break in? What?! 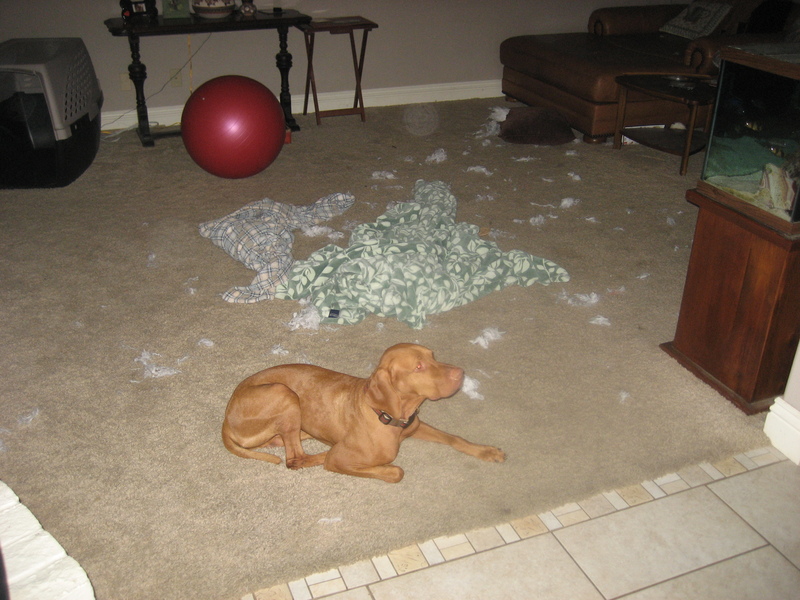 You were just redecorating right? Hey sweet friend, you could help and give her some time for take a good nap.She works so hard! OMD!!! An exploding blankie at your house too? What is this world coming to! I cewtainly don’t notice anything unusual…is thewe a pwoblem? Uh oh, and you’ve got that lonely look on your face. Do you think mama will buy it? Uh oh. Oh Dennis, how could you? Hi Dennis Friend! You have excellent decorating taste! I bet your mommy doesn’t get your designing aesthetic either. We find the humans are always really appreciative of work like that. They call our names and exclaim how they wonder what it would be like without us. Boring. Oh my! Im home all day with Africa, but when I worked with Tonka how well I remember speeding home and passing cars fearing the worst for my house and dry floors. It happens to the best of us! Uh-OH….someone’s grounded tonight. 😦 Better hide and quick! Hope that wasn’t Mummies fave throw! Aww, you decorated the house with that “party with the pups” motif, just to make her laugh, huh? We agree with Jan, mum’s are so hard to train!